The Bembridge House is a City of Long Beach landmark and is listed on the National Register of Historic Places and the California Register of Historic Resources, It is owned operated by Long Beach Heritage. 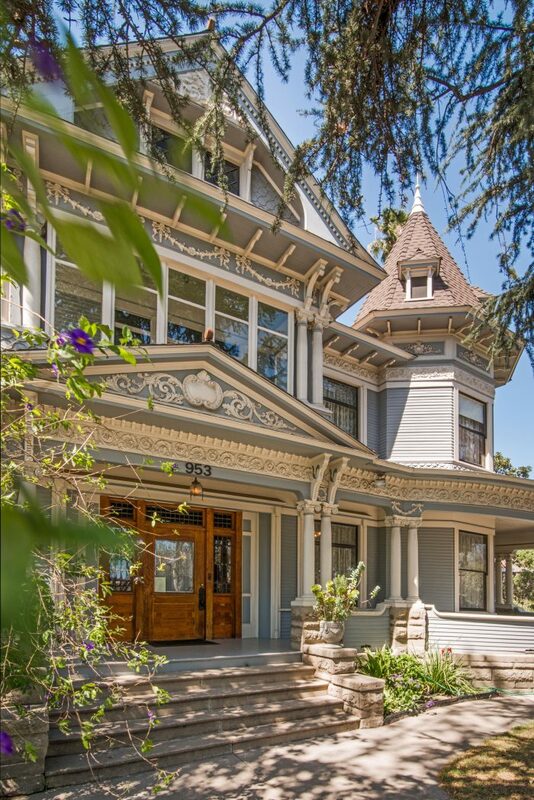 The Queen Anne Victorian residence was built in 1906 by Josephine and Stephen Green. The Greens relocated to Long Beach from Seattle and Mr. Green was one of the founders of City National Bank. The house is a magnificent and highly ornate example of late Victorian architecture, and both the exterior and interior exemplify the finest accomplishments of turn-of-the-century architectural designers and craftsmen. It is the single most important example of this style of architecture remaining in the Long Beach today, and is considered by many to be the most significant residential historic landmark structure in the City. Amazingly, the house is in almost pristine original condition, and contains many of the original furnishings dating from the early 1900’s which were owned by the Rankin family when they purchased the house in 1919. The Bembridge house is two stories surmounted by a full attic. It has a steep gable roof, a porch gable over the entryway, and a corner hexagonal tower crowned by a conical roof. It is clad in narrow shiplap siding, with a band of fish scale shingles between the two stories and inside the roof gable. A deep, continuous porch wraps around the front of the house, from the entryway around the corner tower. Paired Ionic columns support the porch. An ornate frieze of floral design runs under the porch eave, repeated above the windows of the tower. Decorative floral ornament fills the inside of the porch gable and the top of the roof gable. Plaster floral swags are placed over the porch columns and over the second story sunroom. The second floor eaves are widely flaring, with finely carved bracket supports. A sun porch over the entryway was filled in with glass windows in 1924. Inside the front roof gable are paired windows framed with carved bracket supports. Dormer windows punctuate three sides of the tower roof, which is crowned by a pinnacle. The spacious entry door is quarter-sawn oak and beveled glass with ornate leaded glass sidelights. The windows in the parlor, breakfast room and both tower rooms have decorative leaded glass transoms. The house has 18 rooms, including four bathrooms original to the house, and high ceilings. All the original woodwork has its original glowing finish and finely carved detailing. There is a large entry hall with a grand staircase at one side. The balusters are intricately shaped, and the newel post is elaborately carved with inset panels and beadwork. It contains its original brass light fixture with a round stained glass globe. A bay window at the first landing of the staircase has paired floral stained glass windows framed in dark wood and, in the center, a tall mirror framed with aired columns set on posts and carrying a lintel. The ceiling of the entry hall, parlor and dining room have wood beams and their original light fixtures. The parlor and dining room fixtures used both electrical and gas illumination. which were dual gas and electrical. There are squared columns on posts framing the entrance to the front parlor, and pocket doors at the entrance to the second parlor. The fireplace in the second parlor is placed at an angle and has an ornate wood mantel with intricate carving, two tiers of columns and a wide mirror. Pictorial glazed tile frames the fireplace glossy brown-and-tan in color, with three classical female figures: one reclining at the top and two standing at the sides. The dining room is extensively paneled in wood, with a built-in buffet. Floral stained glass windows are set above cabinets framing the buffet. The downstairs walls are finished with sponge-textured paint in soft earth colors. The floors are all wood. The master bedroom is located on the second floor in the corner tower. This room has leaded glass transoms and an original gas-electric chandelier. The house has had few alterations since it was originally constructed. The location of the kitchen was changed from the west side to the east side. A new, smaller kitchen was added at the rear, and an adjacent breakfast room with a bay window was created by enclosing a small portion of the wraparound porch toward the rear of the house. The original kitchen was converted to a sitting room. This alteration, plus the enclosure of the sunroom in the master bedroom, took place in 1924-1926, and have become part of the history of the house, reflecting the lifestyle of the Rankin family. On the east side of the house is a two-story carriage house, built at the same time as the main house and echoing its architectural treatment. The roof is crowned with a cupola. Inside is a hay loft and hay chute. At the City’s insistence, the wall of the lower part on the north side of the carriage house was moved back one foot when the City paved the rear alley. A hexagonal bird aviary is placed on land to the east of the driveway. The significance of the house is due to its extraordinary architectural splendor, its association with the history and development of Long Beach, and its linkage to the history and contributions of Dorothy Rankin Bembridge, whose stewardship preserved the house in its pristine condition. The architectural magnificence of the house was due to the original owners, Stephen and Josephine Green, who spared no expense at creating Victorian-era opulence in materials and design. While several other large-scale Victorian homes from this era exist today in Long Beach, none have total architectural integrity and the interior richness in design and materials of the Bembridge house. It was a pioneering mansion in the City of Long Beach, built in a location then considered to be the western fringe of residential development in a new subdivision. It overlooked Knoll Park (renamed Drake Park), a small circular park located on a high point with views of the ocean and river, donated to the City by Colonel Charles Rivers Drake in 1904. The land was owned and subdivided by the Seaside Water Company, owned by Colonel Drake; this house was one of the first to be built in the new tract. The original address of the house was 735 West 10th Street. The mansion was constructed during a decade in which the population expanded by 600% and the local economy boomed. Its construction overlapped that of the luxurious Virginia Hotel on Ocean Boulevard and other early mansions, such as the Jotham Bixby residence on Ocean Boulevard and Magnolia, which has not survived.